Got the ph meter fired up and did some science. It was good to get back into the swing of things after the last brew day where I skipped some of the usual stuff like checking ph and making a starter. 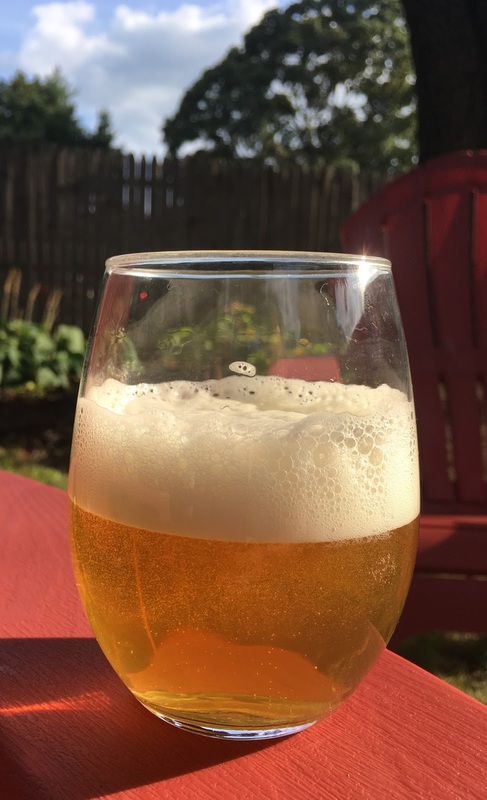 This beer pours an orange like color with a white head of tight bubbles which laces the glass with each sip. I do think I kegged a little late missing my chance for a higher carbonation. Smells of a bready fruitiness...berries, strawberry, crisp citrus....when swirled it has a citrus earthy...grapefruit aroma. The mouthfeel is soft....medium. Medium soft bitterness. Something like that. Flavor is soft grapefruit....bready....a pleasant aftertaste as the bitterness lingers along with the fruity berry like flavor mixed with the wheat. Hoppiness lingers and coats the mouth....but fades...leaves the pallet dry. A proper starter going....sort of the science thing again. So all and all it came out nice. I think I've got the carbonation better on the next batch which is about done. .6 g. Whirlfloc at @5 min. This was a rushed batch and the results showed it. With kids and activities and events it's been tough to fit brewing in and and I hadn't had a beer on tap for a while. While it wasn't a dumper, I had a tough time getting through the keg (my wife took one for the team). The first thing I need to get back to doing is checking my ph...didn't do that with this batch. Just assumed the recipe from before would do the trick. It may have not been my issue but checking doesn't hurt....at least I give myself the opportunity to adjust if I know the ph. Then...I used a two month old smack pack and direct pitched it....cold no less. I had listened to a podcast about Imperial Yeasts and how they recommend pitching yeast right out of the fridge. Who knows if the temp really screwed it up but I think I had under pitched too low. Then! 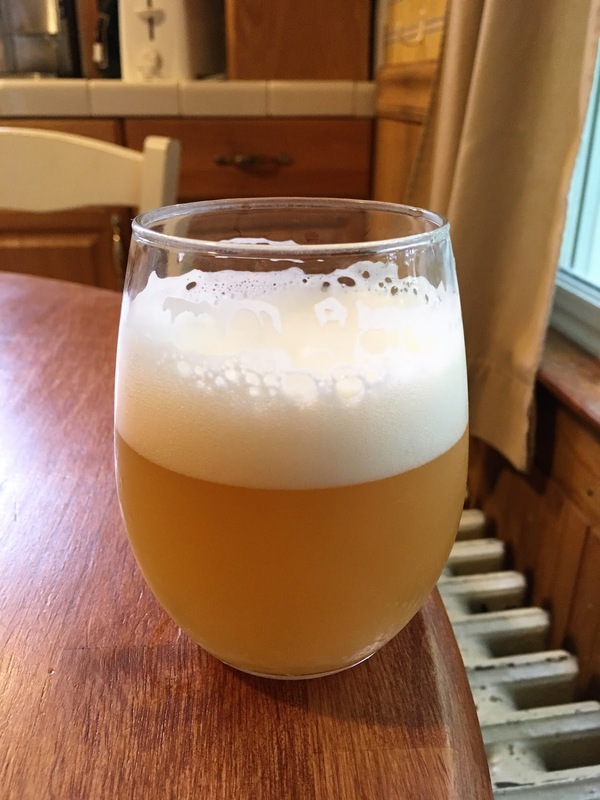 I kegged on day 7 (1.010 for those who are wondering) and threw it into the fridge to carb. Like I said....a rush job. I don't think the yeast had time to clean up. What does all that mean? Ah...well I think I got a bit of diacetyl. It was just hidden behind the hops and annoying. Not quite full blown butter but just a touch enough to make things odd. I'll brew it again because I know when I get it right it's good. But shame on me. 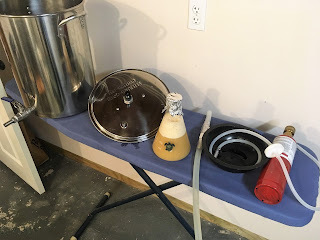 Home brewing is hard enough to learn and even harder to carve out time to do when working a full time job, and raising kids, and having a family life. Cutting corners shouldn't be on the list of things to do....with any of this stuff. .60 g. Whirlfloc at 5 min. 2.00 oz. Nelson Sauvin at 5 min. This time around I lowered the gravity even more and took out the Columbus. I get a strawberry sort of kiwi thing going on with Galaxy, a nice dankness...it's an aromatic hop for sure. The Columbus accentuated the beer but made the previous attempt pithy tasting. No dryness from the hops here...just some fruity...citrus...bitterness. You don't need to have a high abv beer to get the Double IPA effect. If it's just a hop fix you need...it can be done with a lower abv beer. A soft, dry pale ale with big hop aroma and flavor....refreshing and really....really you can drink on it all night. The Brett character shows with a dusty, leathery and fruity combination. 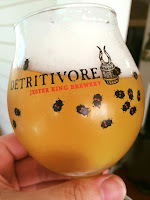 The Saison yeast contributes pepper and fruit. The oak is subtle and a vanilla like note comes through in the background. The mouth feel is good at 3.0 volumes of carbonation...the pepper and bitterness linger a bit and then fade on the tongue and make this beer a drinker. My original intent was to dry hop this with another 2 oz....but as it aged I just didn't think it needed it. While I do get citrus types of flavors and aromas...that could just be the yeasts. At 7.8% ABV I can say it's a drinker and the alcohol does not show in any unpleasant way. This was the first time I've naturally carbonated in the keg. Took longer than I thought to get to the right pressure. I'd hook my spunding valve up about once a day to see where it was at. At 2.5 weeks is was at the same pressure that it would need to be if force carbed. Seemed to work fine with the added benefit of the Brett getting some more time to chew. I could have left it conditioning longer to see where it would go or blending a bit of sour beer would be interesting...things to consider for the next Saison. 2.00 oz. Nelson Sauvin for 10 min. Color: The slight pale yellow/orange color as the last try but a little darker. It has a nice white head. I like the look of this version better. Aroma: I get a whiff of fresh hops initially....grapefruit, peach, spice like with an excellent white wine finish to the aroma. Very good. The wheat shows through and combines nice with the hops. Carbonation was a bit low (sample taken on day two) and the aroma didn't punch as the last version but as it carbs I suspect it will. Mouthfeel: The body of the beer is good but has a slight thinness that I think the carbonation will help. It leaves a lasting pithy dry feeling. Flavor: Repeat of the the last version: "I've never had gooseberry's but if this hop is what they are like I'm sure I'd enjoy them. It's got this unique drying bitterness...spicey but not strong like a Saison spiciness....just a touch...like finely ground pepper. Earthy....grapefuit....very dry finish that fades quick. Delicate. Juice." This version may be a bit thinner due to the higher alcohol. I'd suspect it finished at 1.010 making it just north of 5% abv. Overall: I like this beer a lot. Although the hops popped better in the first version and I think its due to the quality of the hops for this batch. I had three different bags of these hops from different sellers. One bag wasn't worth using, the second was OK and the third was excellent. Since the second one was a 4 oz. bag that I had just purchased I saved 3 oz. of that one for the dry hopping and put the one good bag which was an ounce in the whirlpool with an ounce from the 4 oz. bag. I've really been paying attention to the quality of my ingredients over this last year and have found that the variations are many. I've since purchased a new 8 oz. bag and hope to brew this again soon. it provides a 1/2" blow off during fermentation. Thought I'd share this blow off set up a friend of mine made up for his SS Brewtech fermentors that I've made and used. I've found it works great and figured some people may find it useful for their Brew Buckets. This set up can be used as a blow off tube, a way to perform a pressure transfer, and purge with CO2 while cracking the lid. To do as close to an O2 free transfer as possible I'll suspend my bagged hops in a keg and purge it several times with about 20psi of CO2 and then pressurize the keg after purging. When I'm ready to transfer, I'll hook up my CO2 to the gas fitting on top of the "T" and get the gas flowing at under 5psi to slowly bubble the Starsan in the blow off jar. The transfer tubing I use has nothing on one end and the other end has a liquid quick disconnect installed on it. Right before connecting the open end of the transfer tubing to the racking valve on the fermentor, I'll connect it to the liquid out post on my keg. This releases the CO2 from the keg and purges the tubing. I then open the pressure relief valve on the lid of the the keg, connect the tubing to the racking valve, close the blue handled valve on the blow off set up and open the racking valve to start the transfer. To purge the head space while adding hops or other additions first connect your CO2 to the gas fitting making sure the CO2 is off at this point. Open the two front spring clamps and turn the gas on to about 5psi and close the blue handled valve on the blow off. You can now lift the lid a bit and make an addition to the fermentor. Once your done, lower the lid, open the blue valve again, and close the two spring clamps. You can run a bit of gas though the head space afterwards for a few seconds to further assure you've purged as much O2 as possible. While I don't open my Brew Bucket during fermentation, this is the method my friend uses to do so. The 1/2" tubing fits real snug over the 5/8" hose barbs and won't blow apart with the amount of pressure applied during a transfer. Also, I used some Teflon tape on the threaded parts of the set up. To clean the set up I remove the tubing and soak the assembly and tubing in PBW for at least 30-40 minutes. For this version I used a fresh re-pitch of 1318 which started showing signs of fermentation within a half hour. Compared to the Vermont strain I used previously, this 1318 hasn't cleared up yet. The Vermont stain cleared up much faster and I didn't use Whirfloc in that brew as I did in this one. I'm enjoying using just one dry hop versus two. The transfer from the SS Brewtech Bucket is painless...cause I don't need to worry about hop debris clogging anything. The harvested yeast is as clean as I can get it and seems to be happy when pitched. Not sure what I would change for another batch of this beer. It's a subtle beer and the flavors are not in your face like other IPA's or hops. Do I go for a bigger dry hop? I don't know. Maybe I'll play with the water profile and use a heavier hand. Either way it's a pleasant beer and the hops are nice. Amarillo can stand on it's own. 2.00 oz. Amarillo for 10 min. .6 g. of Whirfloc added at 5 min. Color: An orange color, white head with good lacing, and an opaque haze. Aroma: A mandarin orange/tangerine thing going on. Bready/nutty background. A slight spicy/sweet aroma without being cloying. Not a huge aroma but pleasant. Mouthfeel: Soft. Light bitterness right down the middle. Finishes sweet but dry. Adequate carbonation. Flavor: Like a strong orange/tangerine tea. Earthy, sweet with that bready/nutty thing going on in the background. A subtle beer. Enjoyable. Overall: This beer came out good. I like Amarillo and the flavor is interesting enough to keep me coming back...the alcohol comes through a little (which I like) and cuts through the sweetness of this hop and malt bill. The 1318 was just as good as the Vermont strain I used last time. My experience with GY054 is limited to one brew though. 1318 I've used many times and I'm comfortable with it...no need to change for now. For this beer I went for the easy brew. No ph testing and no gravity readings. It was a joy to brew this way. No chasing numbers and taking samples. It was more like cooking...just hoping the quality of the ingredients shines through. I trust my system enough since my acid addition and salts seem to always fall in place even when I do test. I use The Mash Chemistry and Brewing Water Calculator from Brewer's Friend to calculate all my additions. I did try a new process for this brew. After whirlpool chilling and letting it sit for a while in the kettle I then transferred it to a sanitized glass carboy and set it to the side. Then, I cleaned the kettle and the chiller and everything that I was done with. By that time the trub in the glass carboy had really started to drop out. After letting it sit for an hour or so I was able to rack the clear wort off the trub into another fermentor, add oxygen and pitch the yeast. The picture below shows just how clean the yeast harvested from this beer really was. 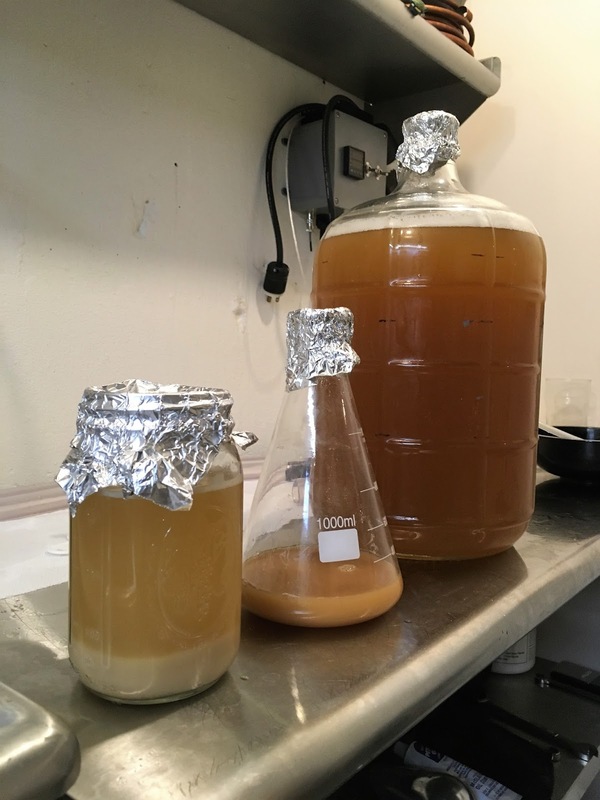 My goal wasn't to reduce haze or eliminate storage issues but just to have as pure a yeast harvest as possible. I think it worked good! I used a pitch of this yeast the day I harvested it for an Amarillo pale ale and within 15-20 minutes the blow off tube was starting to slowly bubble. 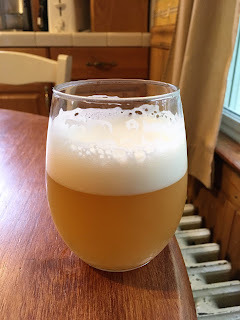 Color: A slight pale yellow/orange color in the right light; pineapple juice looking. It has a white head. Not the most stunning of beers but not bad. Aroma: I get a nice whiff of dank initially....pineapple, grapefruit, peach, spice like pepper. Very good. Mouthfeel: This beer is soft. The body of the beer stands up good....maybe medium. I went for 2.3 volumes and the head indicates that but it feels less. This beer is delicate but assertive with a fading dry finish. Flavor: I've never had gooseberry's but if this hop is what they are like I'm sure I'd enjoy them. It's got this unique drying bitterness...spicey but not strong like a Saison spiciness....just a touch...like finely ground pepper. Earthy....grapefuit....very dry finish that fades quick. Delicate. Juice. Overall: This beer came out very good. A fresh drinker for sure. I'm gonna put this hop right there next to Galaxy on my favorites list. Just fantastic! Rather than sit and click away at Beersmith and Brewer's Friend for this recipe, I used a malt bill from another beer (Mosaic Once Again) and mixed up the yeast and hops. This made for a relaxed brew day since I didn't take pH readings or toil over hitting the numbers because I knew what to expect from the malt bill. This was the first beer I used my homemade spunding valve on. I let it ferment out in primary for about 4 days and then transferred it onto the bagged hops in a purged keg. With the spunding valve on I left it in the ferm chamber until the pressure stopped climbing. At that point I put it in the keg fridge and let it crash for about 5 days. Samples taken during that time were fine and I perceived no off flavors. All for 10 mins. at 180f. Color: A slight orange color and in the right light it's nice. It has a white head that lasts an average amount of time with some lacing. Aroma: I get the fruit up front, and then a slight hint of dry grass. That Citra sweetness is there and it's only a total of an ounce between the whirlpool and the dry hop. After a week or two in the keg that melded into the background and the Mosaic took the forefront with a berry like aroma. As it aged, a citrus/earthy like aroma got stronger. Mouthfeel: This beer is soft and easy and finishes dry. The carbonation is good. The spunding carbonated it a little and I had to play with the hydrometer sample to get rid of the carbonation. As the beer got older the softness dissipated and it dried out more. Flavor: Berry fruits and a slight sweetness along with an earthy undertone. The bitterness was nice at 60 IBU's of Warrior and I'm finding I like this for my tastes in hoppy beers. Finishes dry with a citrus like flavor. As it got older the citrus/earthy flavor seemed to get stronger along with the dry bitterness. But in a good way. Overall: This beer came out good. This one does well to put a little age on it. Not as much as a fresh drinker as some of the other beers.